Developing intuition is something anyone can do, just as anyone can develop muscles with the right training. I define intuition as the ability to understand something instinctively, without the need for conscious reasoning. In later articles, I want to write about how we can instinctively know things, but here I’d like to talk about developing intuition in fiction and reality—about how one woman developed hers. Lucy Thomson began as an intuitive tarot reader—and it is the study of tarot that gives her a secret power; one that she develops throughout the stories. What is the difference between being intuitive and being psychic? For me, it’s a difference of degree. The difference between intuitive and psychic is the same as the difference between warm and hot. They’re on the same scale, and most intuitive people are sometimes psychic, too. This is the card I drew for Lucy when I was imagining her character. 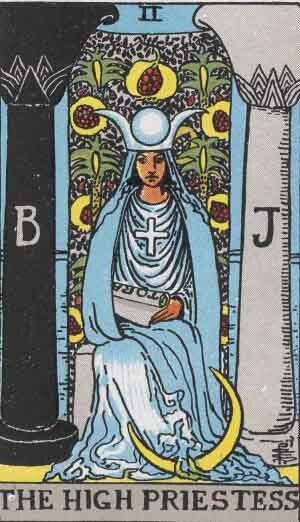 The High Priestess is the card of intuition—she has access to the inner mysteries, as Lucy begins to develop in the stories. Another word that comes up in the stories in relation to Lucy, is empathy. This commonly means the ability to understand and share the feelings of another. However, for some people (in the real world) it means a real and literal feeling of another’s feelings. In my stories, I take it to mean the latter. Some people can feel the physical pain of others, and some of these people can locate physical problems in others. For many people, the empathy is with emotions. This is the sometimes painful experience of actually feeling the emotions, whether wonderful or toxic, of other people. There are many types of empathy, but with Lucy it’s mainly the literal feeling of emotions, but she also connects with all life forms, including animals and plants. Although I don’t mention Thomas much here, he’s an environmental empath, and he feels physical distress when the environment is devastated. As I mentioned earlier, everyone has intuition, even if, for many people, it’s ignored and therefore underdeveloped. The key to developing intuition is to trusting that it is true, listening to it, and acting upon it when it comes. At first, the results can be underwhelming, but don't worry, just keep going. It's sometimes be better not to tell people who are not open to these ideas that you are acting on intuition (or a hunch) as it will often lead to ridicule from those who are too closed to understand. Trusting yourself and listening is an important part of developing intuition. Certain tools help in developing intuition, and as I mentioned in an earlier article (Tarot & Me) the Tarot is one of these tools. Developing intuition comes from experience. 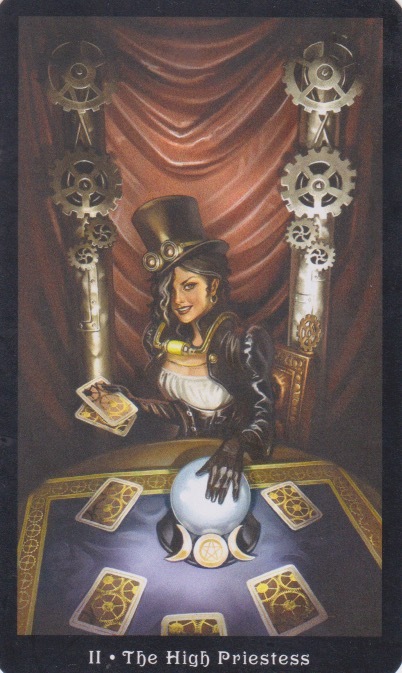 Here the High Priestess (Steampunk Tarot) shows a different face. Lucy begins the story as an intuitive tarot reader in London. She ends up as much more than this. Below, I’ve given some extracts from Blue Prometheus and The Darkling Odyssey, showing her progression, first as she uses the Tarot, and later as she uses a very special oracle deck. This extract is from the beginning of Blue Prometheus, while they are still in London. Thomas wondered how anybody could believe that tarot cards could predict your future. But the class was utterly captivated by Lucy and her colourful cards. Thomas blocks himself here, as he does for much of the story. It’s not until he believes that magic is possible that he gains access to it. Developing intuition is one of his first tasks, and one that Lucy and Aina both help him with. Lucy is more open and naturally ahead of him intuitively. And she has a tool to practice with. “The last card shows the most likely outcome.” The class waited for Lucy to turn over the card. Even Thomas felt a little tense, which he knew was ridiculous. “Well, let’s see the future.” She turned over the final card. The class stilled. Death rode a white horse and around him lay dismembered bodies. The card disturbed Thomas a little, but he reminded himself that it was all just superstition. Lucy began to speak when a brick shattered the shop window. Lucy and Aina are in the Tower—a bleak place built with stone infused with the souls of the dead. And Lucy has a common type of intuitive experience: she just knows something but doesn’t understand why it should be, just that it feels right. They’re fighting for their lives, and have just fought two ice demons—genetically designed reptiles which form elite killing squads for the Empire. One is dead, the other is unconscious. Lucy had intuitively known that it was wrong to kill the demon. Had she done so, then the events of book 2 would have been very different. In book 1, Lucy has her tarot cards to help her tune her intuition, but somewhere between the end of this book and the beginning of the second, she loses them. However, she eventually gains a very special oracle deck. These work on similar principles to tarot, but are usually shorter, and are created in any way the designer feels best. Although her magical oracle deck couldn’t exist in our world, and I played with the magic for fun, the principles behind its use, and the way it helps in developing intuition, are the same as they would be in this world. …she noticed something in her pocket. Reaching in, she took out the oracle deck, remembering that the goddess had said something about it remaining hidden from prying eyes. As she turned them over, a card jumped out. Turning over the card she saw a wolf staring at her. “Who are you?” Lucy had used oracle cards before but had never imagined cards like this. “The will to fight and survive. Shuffle the deck and ask to be shown a way out. Help is in the cards.” Lucy wanted to hug the animal in gratitude. The wolf’s head seemed to reach out from the card and nuzzle her hand; his nose was wet. Then he was gone, and again he stared out at her from the forest on the oracle card. She smelt the back of her hand where his nose had touched; there was a faint smell of wolf. “What type of magic does this oracle possess?” she asked herself quietly. “Shuffle,” the wolf whispered in her mind. The picture moved, and the monkey swam in a forest pool. Other monkeys were sitting on a log. The monkey grabbed the tails of two of the other monkeys and pulled them into the water. Jumping out it raced up the tree and threw fruit down at the others. Then it sat back on the branch and howled, and it was loud. Keys jangled outside. Lucy quickly put the card face down on the top of the deck, and the sound stopped. What was the message? To play? It didn’t make sense. She was about to put the deck away when the card moved. “What?” she asked, nervously turning it over. “I don’t want to play,” Lucy said frantically as the door started to open. “Monkeys know the value of play.” Lucy jumped as the brightly coloured monkey reached out of the card and pulled her nose. The door was opening, and she had no idea what to do. She didn’t want them taking her oracle deck. “One that helps you release your natural magic more easily.” Then the monkey howled with strange laughter and leapt from the card, climbing the door as it opened. “Are you real or a part of me?” she asked. Lucy had no idea. She put the cards away, and they seemed to melt into her pocket, almost as if they weren’t there. But the bright red and orange monkey remained. “What’s the noise?” the man said. The true purpose of oracle decks, she thought as they walked down the street. In my next article, I want to show how Lucy talks to animals. And sign-up to my newsletter, my RSS feed or like my Facebook page to make sure you don’t miss the next article.